The anxiety you experience due to morning breath can cause you to quickly mumble your goodbyes to family on the way to work, and keep a bottle of mouthwash stashed in the glove compartment. By now, you’re convinced that no matter how often your brush, floss or guzzle mouthwash, the lingering odors from the night before will continue to overwhelm your breath well after you wake up. While you might think this problem is a burden you carry alone, getting out of bed with bad breath, clinically referred to as halitosis, is actually fairly common, and is just part of the cycle of rest and digest our mouths go through overnight. Fortunately, your Eugene, OR dentist wants you to know that morning breath isn’t some unstoppable force destined to ruin your day. In fact, you can take a few steps that will help to keep your breath from smelling less than its best. Here’s what you need to know to help prevent morning breath. Around 80 million American suffer from persistent bad breath, according to the Academy of General Dentistry, while millions more suffer from occasional bad breath in the mornings or shortly after eating pickled onions and liverwurst for lunch. People who suffer from dry mouth, a common side effect of many prescribed medications, and those who tend to breathe through their mouths are more prone to experience morning breath. Individuals who practice poor oral hygiene will also suffer from bad breath when compared to those who brush and floss at least twice daily. Early morning bad breath is largely the product of low saliva production. During your waking hours, the body produces far more saliva than while you’re asleep. A continuous flow of saliva allows the mouth to wash away foul-smelling bacteria and lingering food particles that help sour your breath. Low saliva flow allows these substances to remain in your mouth and sour your breath. Since saliva flows plays such a critical role in preventing dry mouth, it’s no surprise that a decrease of saliva increases the likelihood of dry mouth. This enables bacteria to thrive and produce volatile sulfur compounds that smell bad. Oral bacteria also feeds on the amino acids, proteins, compounds, and leftover foods that remain in the mouth between teeth and along the gum line to produce even more volatile sulfur compounds, which only makes your breath smell worse. The way you sleep can also impact the frequency and intensity of morning breath. Breathing through the mouth or snoring at night increases the likelihood of bad breath. Since most “mouth breathers” sleep with their mouths open, the constant airflow can cause their mouths to dry out and allow bad breath causing bacteria to flourish. Ultimately, anytime you reduce saliva flow in the mouth, you increase the risk of morning breath. Unfortunately, there’s very little you can do in order to completely prevent morning breath. However, by practicing quality oral hygiene throughout the day, especially prior to bedtime, you can help to reduce the amount of bacteria and lingering food particles that remain in your mouth overnight. The fewer compounds bacteria has to work with, the less volatile sulfuric compounds it can produce. Make sure to brush in the morning following breakfast to improve your breath for the rest of the day. 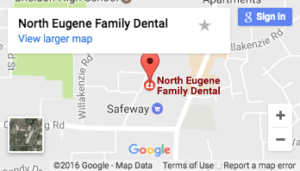 To find out more or schedule your next dental appointment, call North Eugene Family Dental, your Eugene, OR family dentist today!